Mage’s Death Knight Hero Card Leaked? 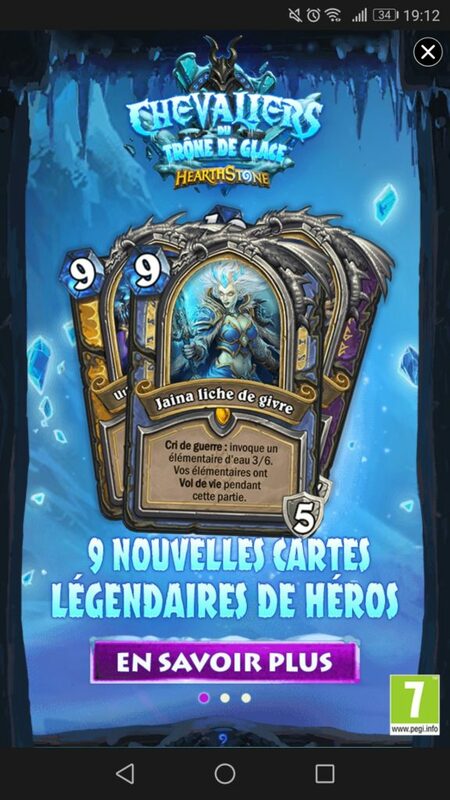 A rather convincing leak has hit the internet and it’s of what could be the Death Knight Hero Card for Mage: Jaina, Frost Lich. Check out the video and judge for yourself whether you think it’s fake or not! 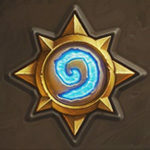 Follow Hearthstone Top Decks on Twitter, Facebook, and Join Our Discord to be notified of new decks and news! The translated version of the card is below. Keep in mind that we don’t know what the Hero Power is quite yet. Also note that Uther and Gul’dan’s cards are behind Jaina’s and cost 9 and 10 mana. I checked the translation against other existing Hearthstone cards and it appears to be the correct text. 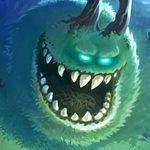 I’ve tried reverse image searching for the card image and have come up empty. If this is a fake it’s the best I’ve ever seen. We have NO way to verify that this is real at the moment. I’ll keep this post updated if we learn anything else! I’m going to assume this is fake because the Hero Card art does not match the artwork of all the Death Knight heroes like Rexxar’s does, even though the ad looks pretty legit. I’m French and i can attest the translation is almost perft (if the card is not a fake). But “your elemnatl get Lifesteal for the REST of the game” might be a little bit confusing (there is a redonduncy, the word “rest of” is not needed according of the mechanic of battlecry) , with this description you might think that all your following elemntal will get the effect (so not including already played elemental), while french description would be more accurate with the fact that all the elemental on your side of the board have the effect. That English is technically correct, however as a native speaker it sounds pretty weird. I think “rest of” makes sense for the English version. I hope this is just fake, because it’s a pretty weak class hero card for mage… It costs wayy to much for what you’re getting. But you have to play this on turn 9 which in any tempo/aggro match-up is really hard to do, it’d be like the same as dropping a Yersa but only getting a 3-6 water ele with lifesteal and +5 armor instead. It has no impact on the board the turn you play it (kinda greedy). There will also be a new hero power, but you can’t see what that is on the card. There’s nothing on the Rexxar card to indicate the “build a beast” hero power, but the whole point of the hero cards is that you get a new hero with a new power. So it’s hard to judge this card is without knowing what the hero power is. Freeze mage even stronger than before! Hero Power: Build-an-Elemental. Discover a custom Zombielemental? only thing that makes me question it is the fact that the art doesn’t have the pink streak in her hair that the other representations of her this set have had. seems like something they would want to keep consistent across artworks. You mean like Liadrin as the Shattered Sun Cleric? I’m not saying it’s legit (altough it looks like it is) but it seems unlikely that people would release a fake card in French rather then English. looks legit. pushes mage in a newish direction. with 9 mana im guess the hero power will be pretty powerful. The biggest giveaway of fake cards is how the card name on the banner does not perfectly match the curvature of the banner itself, as we can see in this english version mockup. The french original seems legit, but I wouldn’t jump on the hype train just yet. The big issue here is the lack of a Death Knight hero power – for some reason I was left with the impression that all hero cards give you another hero power (also historically, cards that change your hero have always changed the hero power as well). The Death Knight Heroes do give you a new hero power, it isn’t mentioned on the card unfortunately. The video to me is the part that sells me on this being real. That’s a lot of effort to put in just to create a fake. I’m not saying it isn’t possible, it’s just very unlikely. Now that you mentioned it, there really is no mention of Rexxar’s hero power on the card, which makes me believe in this even more now. 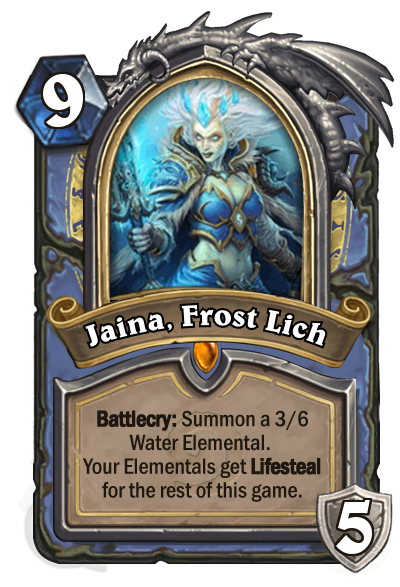 The only question I’m left with now is what the hell do Death Knights have to do with Elementals and why would that be Lich Jaina’s identity. They won’t stop making elementals after Un’Goro, but out of everything mages have access to the are the least likely to aid the dead.